It’s been a while since we’ve heard from The Story So Far, but right from the opening bars of their latest, self-titled album, it’s like they never went away. The fuzzy reverb, the stylised lo-fi production and wandering melodies from 2013’s What You Don’t See are all there, unchanged since their last outing two years ago. It feels like rolling up at the corner shop with minutes to spare before it closes, to find that they’ve sold out of Ben and Jerry’s, and only have plain vanilla Wall’s left – not bad, but slightly disappointing. Bands with a distinct sound walk a double-edged sword, though – especially when that sound is part of a bigger movement. Is it best to keep on writing material that you know your fans will like, or throw in a few surprises and risk being the freezer with no ice cream in it at all? 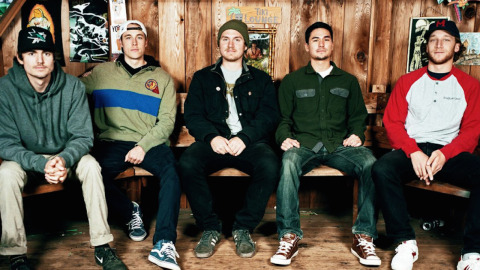 The Story So Far are one of the more introspective outfits in the pop punk scene, favouring the melancholy over the frenetic, but still weaving plenty of true punk attitude into their sound. Dedicated fans won’t be bummed out that their third album sounds incredibly similar to the first two, because there’s nothing particularly wrong with it, but those who haven’t listened to them by now aren’t going to be drawn in. Opening track Smile is an upbeat number that rides on the chorus and is shot through with angry shades of Thrice and Millencolin. Heavy Gloom and Distaste are packed with attitude, but it’s around this point that the melody starts to fall down. Of course, there’s no need for every song under the umbrella of melodic rock to be a potential karaoke belter, but TSSF’s bothering of the same three notes for as many tracks in a row becomes a little grating. Things don’t really pick up again until How You Are, which brings back the power with a deceptively gentle intro, before launching straight into an impassioned verse. The stripped-back instrumentals make Parker Cannon’s vocals truly stand out for what feels like the first time on the record. For anyone who did fancy a sing along, Nerve is the one for you. It’s the bounciest track, with a satisfyingly phrased chorus that’ll make you want to skank like it’s a Jimmy Eat World concert ten years ago. Phantom is the token slowie. The repeated lyric ‘It’s hard to attract you / got me so dark blue,’ drawled lazily over a slowly-strummed guitar, gives it the feel of an album track from a chillout lounge compilation, which isn’t a bad thing as much as it’s the weird kid in the corner, eyes averted from the popular crew that’s the other nine tracks. Closing track Stalemate gives a half-hearted attempt at ending on a high – it’s one of the most tuneful tracks, but still doesn’t pack the punch that the album’s lacking. It’s not that TSSF should break completely away from their roots and polarise their fans a la Fall Out Boy, but album one and two are the biggest hurdles for any band; the third is a prime time to throw in a few new sounds. A bit more experimentation – and switching up the key of their songs every now and then – definitely wouldn’t go amiss.